Back cover blurb: The incredible story of the Auschwitz-Birkenau tattooist and the woman he loved. Lale Sokolov is well-dressed, a charmer, a ladies’ man. He is also a Jew. On the first transport from Slovakia to Auschwitz in 1942, Lale immediately stands out to his fellow prisoners. In the camp, he is looked up to, looked out for, and put to work in the privileged position of Tätowierer– the tattooist – to mark his fellow prisoners, forever. One of them is a young woman, Gita, who steals his heart at first glance. His life given new purpose, Lale does his best through the struggle and suffering to use his position for good. 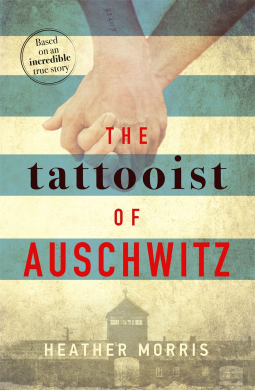 This story, full of beauty and hope, is based on years of interviews author Heather Morris conducted with real-life Holocaust survivor and Auschwitz-Birkenau tattooist Ludwig (Lale) Sokolov. It is heart-wrenching, illuminating, and unforgettable. When Lale Sokolov arrives at Auschwitz-Birkenau his only goal is to survive each day. He is determined to leave Auschwitz alive after bearing witness to his friends disappearances early on. Lale finds himself desperately trying to blend into the background, but his kind, caring and courageous nature makes him stand out to his fellow prisoners. He is quickly put to work as the camp Tätowierer or tattooist, marking each new prisoner with a unique number. It is a horrific but respected job and Lale is soon in a position of privilege. He is moved into a special block, fed good rations and generally looked after by his commanding Nazi senior officer. Lale learns quickly, and uses his new position to help and befriend where fellow inmates. One day whilst on duty Lale is entranced by the beauty of the young woman before him. He must continue to tattoo her against his own wishes if he is to not be punished. He later finds out that she is called Gita, but she will not tell Lale her surname. Gita promises to tell Lale her surname if and when they both leave Auschwitz. They both know that the odds of them both leaving alive are poor, but belief is what will get them through the most harrowing and desperate of times. Alongside belief they have each other. The tattooist of Auschwitz is a story of love against all the odds. It is beautifully written, desperately sad and at the same time triumphant. A must read WW2 novel. The Tattooist of Auschwitz is available from 11 January 2018.